February in Norway is snowy white and icy cold. It often turns gray and bearably cold but never goes without the snow. Sometimes when I wake up I hear birds in the distance and I know that the day will be warmer or that maybe the sky will be blue for a change. On the days when I get to see the sun I feel like a mole who's crawled out of its earthy home. I miss the brightness of the sun and the warm breeze from the fjord. I miss the color of summer and the smell of late spring. But I also try to embrace the monotony of February, hoping it is here for the better. For example, look at the following photo. See how much activity there is? 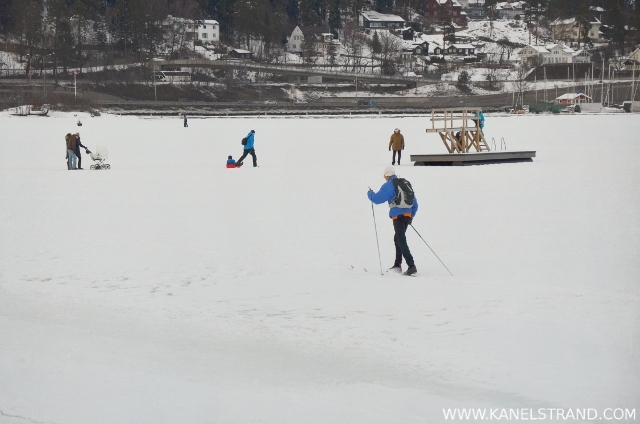 The skiing man, the family with the baby stroller, the lady pulling her child in a sleigh, and the swimming dock, they all are on the frozen waters of the fjord. You can see the boats in the far right corner. It is an amazing feeling, having to walk on thick ice with so many people around. Some of them picnicking, others fishing through a whole in the ice, or simply walking from island to island. The change in perspective is unforgettable and a great exercise in boosting your creativity. The secret life of the sea. Turning back, there is an even better view of gentle reflections of the setting sun. Yes, this is still the same sea. 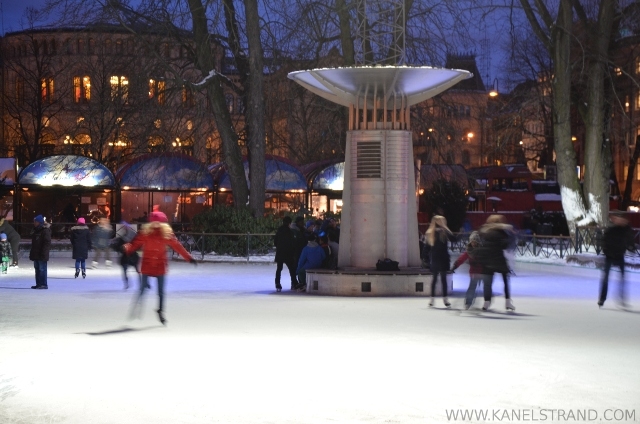 There is ice even in the middle of Oslo but people skate on it. In other words, ice and the weather are being throughly enjoyed by a nation used to live in an unfavorable climate. Some places the ice brings stillness and poetic oblivion. 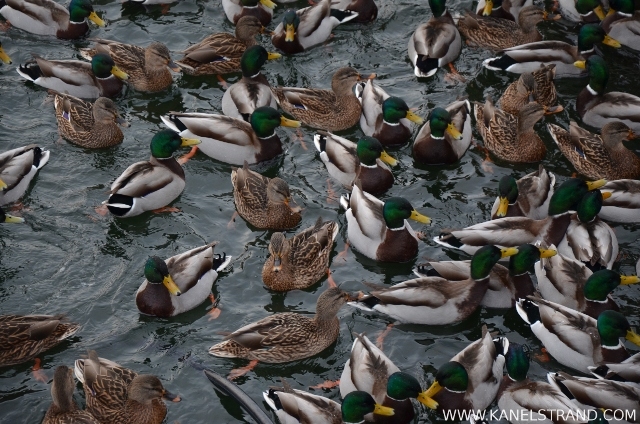 But where there is no ice, it is crowded and even livelier. At some spots along the river, the municipality has been warming up the water in favor of the wild birds like geese and swans. The presence of wildlife is more subtle sometimes but that makes it ever so magical. 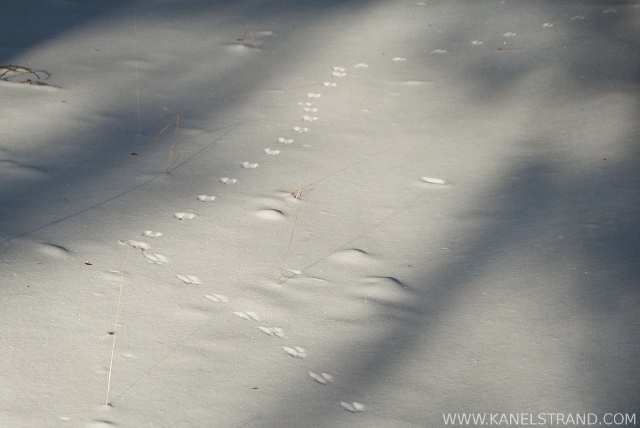 I love the hue of the snow - different in every moment of day and under the footsteps of animals an man. 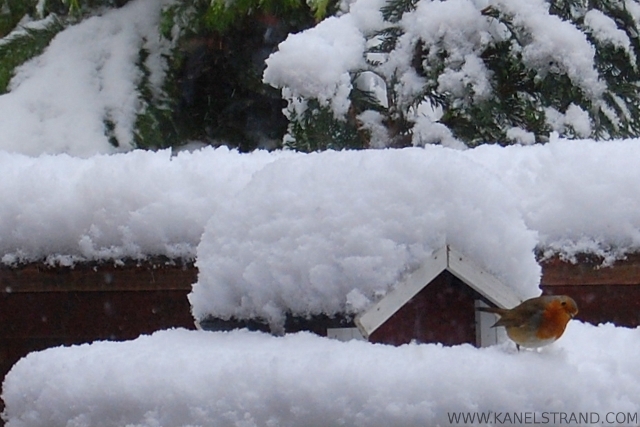 But what I love most is my feathery friends whom I can see much better on the background of white fluffy snow. What do you love about February in your part of the world? 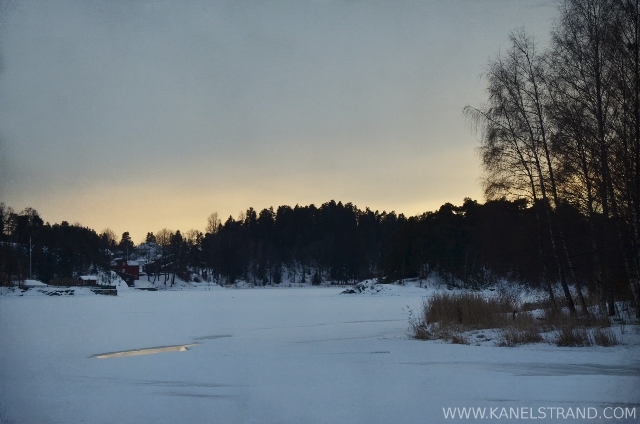 This post is part of the Seasons in Scandinavia series on Kanelstrand. Beautiful photos, Sonya! I think we just call that a dock, sometimes a "swimming dock" when it's in the middle of a lake, for example. It's nice that there's so much activity during winter in Norway. There is here as well, though our winter isn't as severe as yours, I'm guessing. It goes against my nature, which just wants to curl up under a pile of blankets and hibernate during winter. I have to push myself to go out and do things when it's very cold or a day like today...we're having a "wintry mix" of snow/freezing rain, which is just yucky. I am all for warm weather too but I try to accept the challenge of cold winter and go out and try to enjoy. But I can hardly imagine something worse than freezing rain in wintertime! As ever, your photographs and descriptions are so evocative! Just makes me want to go and see for myself: and I loathe snow with a passion! Oh, thank you, Isobel. This means so much to me. Thank you, Sonya, for sharing these beautiful perspectives of February in your part of the world. I enjoyed the "tour" & feelings of positivity and peace your photographs exude. What I am currently loving about February along the central coast of California...spotting whales off shore, our almond tree's blossoms, bird songs, peaceful sunsets, starry nights, a few warm days mixed in with the cool, a hint of Spring on the horizon. Ah, almond trees blossoming? I cannot even imagine that in February! In the Southern part of Norway, where spring comes first, trees start blossoming in May! It must be so beautiful right now in your part of California. Your description will keep me warm today. Photo #4 is my favorite. The stillness, the peace. Love it. All of these photos are so beautiful. February for this year has been a little odd...Reaching high temps of about 70 degrees F for Valentine's Day, and then rain today, I'm trying to remember what a "normal" February is! It is so hard to remember how normal seasons looked like, isn't it! It seems like everywhere in the world seasons have totally changed. Thank you for stopping by, Kim. Enjoyed reading this. Just fyi, it's mole instead of mold...On the days when I get to see the sun I feel like a mold who's crawled out of its earthy home. Ah, I am ashamed of my silly mistake. Of course I cannot feel like mold haha, thank you! Oh, yes. Coming back red-cheeked to a hot chocolate or a warm soup is a favorite! Gorgeous photos! I love the boat one!! February in Southern California is usually a little rainy, a little windy and pretty chilly (by our standards anyways). We actually have a chance of snow tonight - now thats rare! 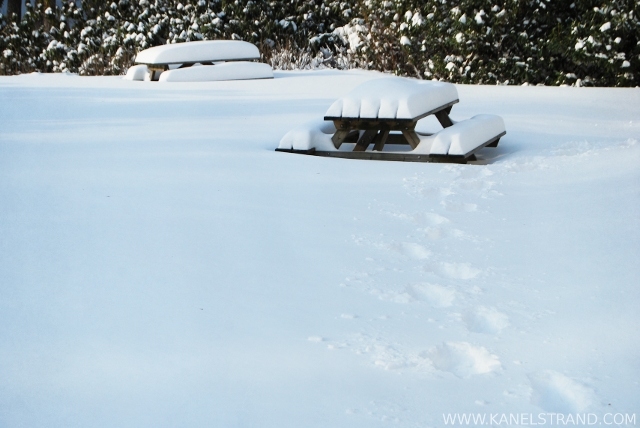 Ah yes, it must be even colder for you, if you are not used to snow! I always love these glimpses into your part of the world. I now realize that I've never walked on an iced lake! Yes, yes, both are amazing in their own way - the excitement of walking from island to island is a self-centred joy and warming up the water for the birds is altruistic. I like that life offers us these chances of different experiences! Wonderful collection of photos, and beautiful place to live! 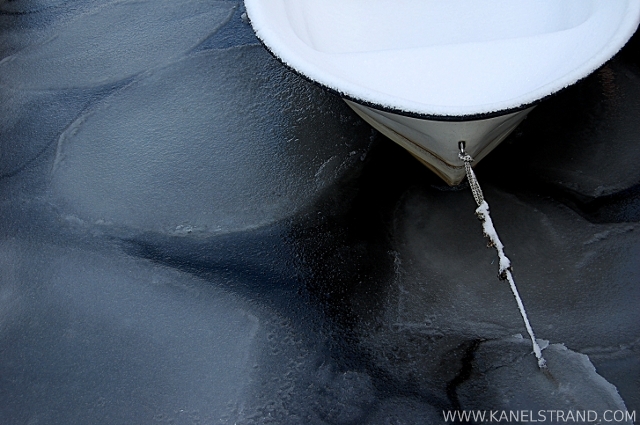 I love the photo of the boat on the frozen water, just amazing. As always your words are so poetic, I can almost feel what winter is like in Norway. Wow--really beautiful photos. Very fascinated by the dude who's just skiing around on a lake. I live too far south for snow, it's always been something really mysterious and magical to me. I mean ice falling from the sky--that's unreal. Thanks Rachel. I have to point out that the guy is skiing on the sea, not on a lake!